I made two on the left. Mama made the two on the right. Mama and I sculpted these lovely clay vessels at a pottery class we took last month. 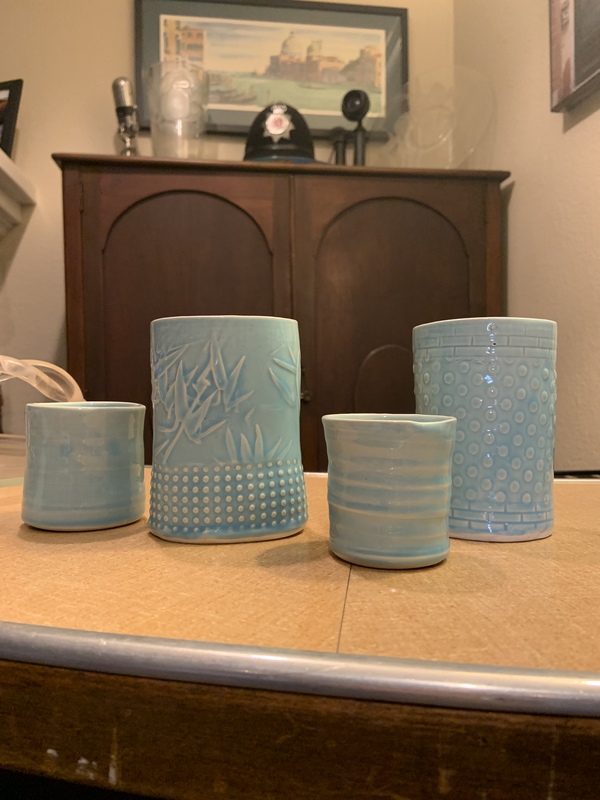 The studio fired and glazed them turquoise, which we thought was an excellent choice. We handbuilt the taller cups and stamped the patterns into the clay, while the little ones we made on the wheel. Since we’ve only just picked them up, we’re enjoying them as temporary decor in our living room. But eventually, I plan to store makeup brushes in my bigger one. Today’s #OneGoodThing was enjoying our pottery class creations with Mama. What was your #OneGoodThing today? Please share in the comments! Day 54 of 365. And Day 1,150 in a row (here’s the first 366, & the following 365, & the third year of 365 good things)! How satisfying it must be, to gaze on your own creations!